Would you like a wall to go with that ceiling? And in this week’s edition of Cribs, we’ll be checking out the dopest of religious abodes aka the Pope’s main hang aka the Sistine Chapel. Sup, Vatican City. Around the late 15th century when the papacy starting trending again, Rome wasn’t just the major religious center, it became the hub of artistic growth. The papacy was all about building stuff that made the olden pagan past of Rome look mad weak. Peeps like Leon Battista Alberti, Piero Della Francesca, Masaccio, and Botticelli were summoned to pimp up the city (I’ll drop the slang now before I embarrass myself further). During this same time period, the Sistine Chapel, (named after Pope Sixtus IV della Rovere i.e. the guy who commissioned the project) was completed and in that same vein to add new adornments to religious Rome, Pope Sixtus IV commissioned a cycle of frescoes for the walls of the chapel. He asked that scenes from the life of Moses and Christ be shown on each wall, thereby embodying the Hebrew Bible and the New Testament. Most notable among the guys asked to paint this cycle of frescoes were Perugino (made The Delivery of the Keys) and Botticelli. In 1508, came an embittered Michelangelo, hired against his will as a painter not a sculptor by Pope Julius II. The ceiling was originally painted blue with gold stars to represent the heavens, obvs, but along came Michelangelo who proceeded to change to face of fresco painting. Scenes of Creation all the way up to the Fall cover the ceiling in the form of muscly people enacting these narratives (even the women look as built as the guys, but with D-cups). This was a tough project for Michelangelo, who had to build special scaffoldings to be able to work properly and then of course, the mapping of perspective in this spectrum of visuals played out by more than 300 human figures can’t be a walk in the park, either. Years later, in 1989, a whopping 12-year project took up the cleaning and restoration of the Sistine Ceiling! But this is more than just the location of salient artworks. 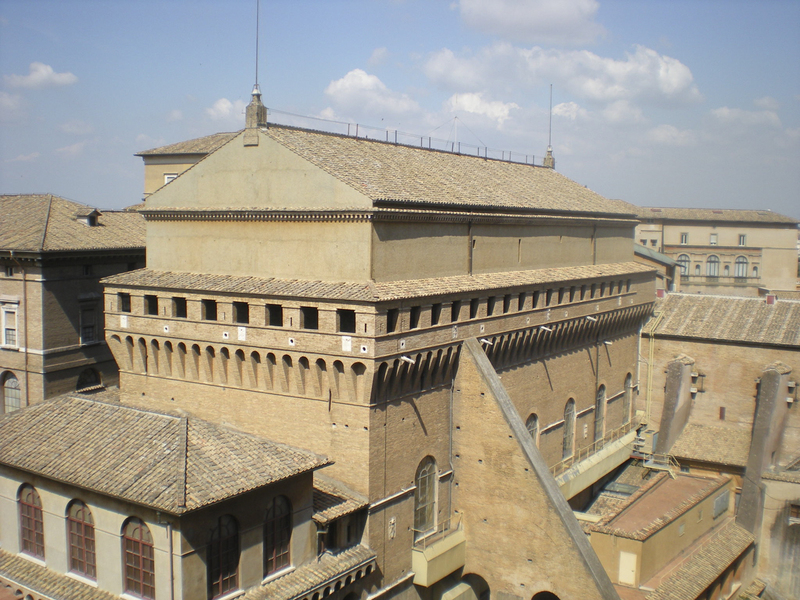 Let’s not forget, this is where the papal conclave takes place. So while the clergy gets together to pick out the next Pope, Michelangelo’s robust nudes enact the history of the human race above them and Perugino’s Christ hands over the keys to St. John, the first ever pope. Feel free to be struck dumb by symbolic reverie as you stand in this holy crib. Check out the full Wikipedia article about Sistine Chapel.